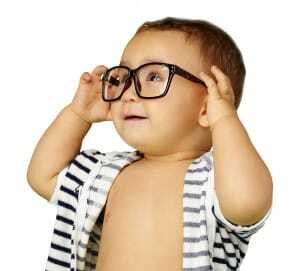 Proper children’s eye care is a common concern among parents. However, the good news is that in most cases, there’s not that much a parent has to do in terms of their child’s vision in the first year. While there are a few issues to watch for, generally speaking, a child’s eyes take care of themselves for the first year. In fact, many of the eye care concerns new parents have aren’t really issues at all. It’s important to think of a child’s vision in terms of milestones. Like every other part of their body, their eyes are still developing and their brains are still figuring out how to use their eyes. For the first three months of a baby’s life, their eyes will have very limited ability to focus. Babies can only focus about 8-10 inches from their face. Likewise, they’ll have trouble getting their eyes to coordinate. It’s not at all uncommon for a baby to go cross-eyed or wall-eyed every now and then. By about 4-5 months, a baby should be able to focus on objects a few feet away, as well as following moving objects with their eyes. Parents who want to encourage good vision development should focus on moving objects around for babies to look at. This is when a child should develop 3-dimensional vision and begin being able to accurately reach out and grab for things. Grabbing will start around 3-4 months, but will be initially unfocused and uncontrolled. Again, this is totally normal: Their brains still have to sort out the 3D world around them. Then, by 8-12 months, they should be displaying decent hand-eye coordination and -in particular- will start becoming skilled at throwing objects. This is the big clue that their 3D sight is working properly. Consistently red/splotchy eyes can indicate infection. Excess tears, especially when not truly crying. Frequent or constantly misaimed eyes past 3-4 months. High sensitivity to light past 6 months. Cysts or styes on eyelids. Whether you find these symptoms or not, your child’s first eye care appointment should happen around 10-12 months. Once their eyes have had time to develop, it’s time to contact your Phoenix Optometrist for their first checkup!